Dogs and cats love fresh, oxygen-rich water. With the Drinkwell Platinum Pet Fountain by Petsafe, this is no longer a problem. The Drinkwell Platinum Pet Fountain by Petsafe comes in an attractively shaped design similar to that of the Original Drinkwell Pet Fountain by Petsafe. A free waterfall animates your pet into drinking more so that your cat or dog receives sufficient quantities of water, which boosts and supports their overall health. Drinking fountains are recommended by vets the world over since they can reduce the risk of a build-up of urinary gravel and stones! The benefits of the Drinkwell Platinum by Petsafe are an integrated reservoir and additional prefilter, which prevent particles such as hair and bits of food getting into the pump. The new design and the use of a high quality pump make the Platinum Pet Fountain by Petsafe virtually noiseleΒ. Naturally, after 10 years of experience producing fountains, you can trust in the proven quality of Drinkwell. A filter is included in the delivery, which should be replaced at the latest after 4 weeks. Size: approx. 40 x 27 x 26 cm (L x W x H) Integrated reservoir, capacity apprx. 5 litres Uses approx. 2 watts/hour Dishwasher-proof Free falling stream, like out of a tap Freely adjustable water flow 1 active carbon filter (with 2 compartments) comes with delivery Delivery includes integrated prefilter Ramp reduces noise and splash of water Virtually noiseleΒ thanks to the high quality pump Non-slip feet Colour: light grey stippled Please note: This device is designed for use in Germany and thus comes with a power adapter for use in the UK. 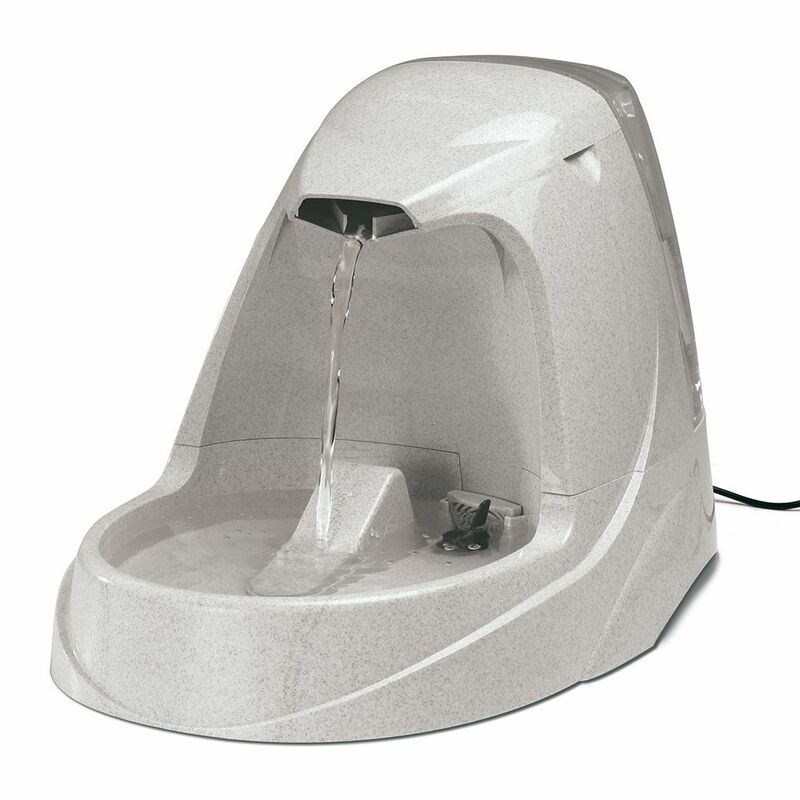 Important instructions: The device must be cleaned once a week with hot soapy water because cat/dog hair and other particles can impair the operation of the Drinkwell Fountain by Petsafe. Furthermore, the device and especially the motor (pump) must be de-scaled with vinegar water every 2-4 weeks depending on the water hardneΒ. After cleaning or de-scaling, it is important to thoroughly rinse the device. Please also make sure to maintain the water level. The pump should under no circumstances be allowed to dry out. If dried out, the warranty will become null and void. It is recommended that the filter be changed every 4 weeks. You have a choice between the regular and the premium replacement filters. The premium filter is even more effective due to the division of its 6 compartments as the charcoal granules are distributed even in the filter, thus achieving more effective and integrated filtration.